John Lewis has a charming selection of colourful gifts and delightful characters, to brighten up your home for Easter. 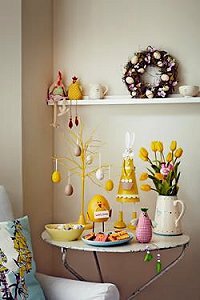 Choose from, Easter Bunting 3mtrs £6, Yellow& Pink bunny £8, Pack of six Spring flower pegs £3.50 Yellow wicker tree £15, Wreath £18, Jug £18, Pack of six Foam eggs £3.50, Polly’s Pantry table-ware from £15, bowls from £5 and Characters from £5. Hanging Rabbits, per bag £3.50, Bunch of Faux Tulips £3.50, Easter Frieze £9. Glass Bauble Egg with Feather set of twelve £5, Blossom Rose Bunny £14. Egg Cups containing Chocolate Eggs, £4 each, Bunny Box with Chocolate Eggs £9. 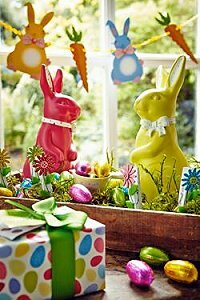 For further information and to view the entire John Lewis ranges of charming bunnies, egg decorations and sweet chicks, visit the website.